Sanctuary Ole Lentille is a 14,500 acres conservancy located on the northern most end of the Laikipia Plateau with a scenic view of Mt. Kenya, Mt. Ol Olokwe the sacred mountain of the Samburu and the Karisa hills and Mathews Ranges. With hills and deep valleys full of wooded acacia, fig and fever trees, African olives and different savannah grass species it is home to the endangered African wild dog, leopards, spotted hyenas, klipspringers and the greater kudu. At the Sanctuary at Ol Lentille, accommodation is in four private houses which can be all taken collectively to fit 12-16 people. The Sultan’s House that sleeps 2-4 people exudes the coastal vibe. It is built into massive stones and overlooks a natural watering hole favoured by the elephants. The house is primarily designed for couples but the spacious living room can be converted into a children’s’ bedroom. The house features a large bedroom with a handmade four poster bed and other beautifully carved furniture and at the far end is a bathroom. The Chief’s House sleeps 6 people is decorated with the best arts, fabrics and artifacts from across the continent. 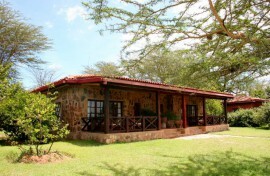 The house offers breath taking views of the mountains and deserts of northern Kenya. The house has 3 bedrooms each with a king size or twin bed. The sitting room has a fireplace and a plunge pool on the outdoor deck with a spacious living room adjoining the living room as well as a spacious kitchen from which your meals are prepared by the chef. The Colonel’s House sleeps 4 people and offers a panoramic view with the highlights including the snow-capped peak of Mount Kenya and the watering hole. The house is built on two floors with two bedrooms on the upper floor which feature dressing rooms, sunken baths and a roofless shower room. The lower level has the living room and the dining room that is right next to the plunge pool courtyard as well as the modern kitchen. The Eyrie sleeps 2 persons and recommended for couples, honeymooners and wedding anniversary celebrations. The house is perched on top of a rocky outcrop with a unique décor style and boasts one of the lodge’s best views from its circular bedroom. The house also features an open air bathtub among the natural rock as well as a personal dining pavilion. 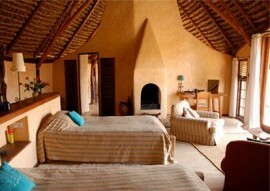 At Sanctuary Ole Lentille get to enjoy a good read, write there is a library with high glass stained dome shaped walls. Atop the library is the club room with a viewing deck with an open fire, a bar and a GPS controlled telescope where guests relax and share their adventure. 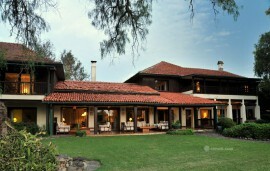 There is also a massage and Spa parlor where guests get to unwind after a game drive or bush walk. 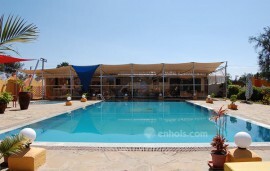 There is also a swimming pool with lounging pods with cosy cushions, a dining and sun downer deck under sails. Mountain and quad riding, kayaking and river rafting and helicopter rides are some of the activities to indulge in during your stay at the hotel.